I’ve been writing less frequently on this blog than I’d have hoped possible. There are a number of reasons for that but the primary one is, ironically, my daughter Gy. Gy will soon be ten, in actually 10 short days from now. It’s not the teenage years just yet but you’d be surprised to know how much changes from the time our kids are these tiny truffles of joy to the time that they start moving around, find their identity, pick up a few defiant cues due to peer pressure and try to walk the tightrope between being a ‘good kid’ and a ‘cool kid’. A parenting blog is a lot of things, or rather, it can be. It can be a set of guidelines on how to bring up kids, a recipe resource for moms of infants or toddlers, a go-to helpline to deal with bullying (cyber or otherwise), anything to do with positive or gentle parenting and yes, it can be a place to rant about everything that’s difficult about being a parent. In my case, there was nothing concrete in mind when I began this blog nearly 9 years ago. Honestly, it was just going to be a space to share milestones in my daughter’s journey and significant ones for me, the parent. It’s grown to something much bigger and that simultaneously excites and terrifies me. Oh, wait. I don’t think I should say ‘terrify’ on a parenting blog. Then again, why not? Because, it quite simply is one of the most challenging roles out there. This is true, whether you’re a dad or a mom, a single parent or a co-parent, an adoptive mom or a foster parent. What’s the real challenge though? It’s that our roles as parents keep evolving as the kids grow older. From being this indulgent, super fun mom when they are babies to being the mom who may occasionally crack the proverbial whip when it comes to curfews and habits. As of today, it’s 307 days since I’ve yelled at my daughter. I just haven’t raised my voice or seen the decibel levels rise in nearly a year. That didn’t happen without effort, though. I can’t say the same for my frustration levels and things said through tightly gritted teeth. What do we do then? We learn to do two things: Let go and hold on. Letting them go is where you gently cut the apron strings and let them explore- places, friendships, relationships, respect for teachers and elders, building a bond with community members and watch as they make errors in judgment. Holding on is what we have to do when it comes to the critical skills- talking about bullying, place emphasis on timeliness, being disciplined, following a work ethic and teaching them how to strike that balance. 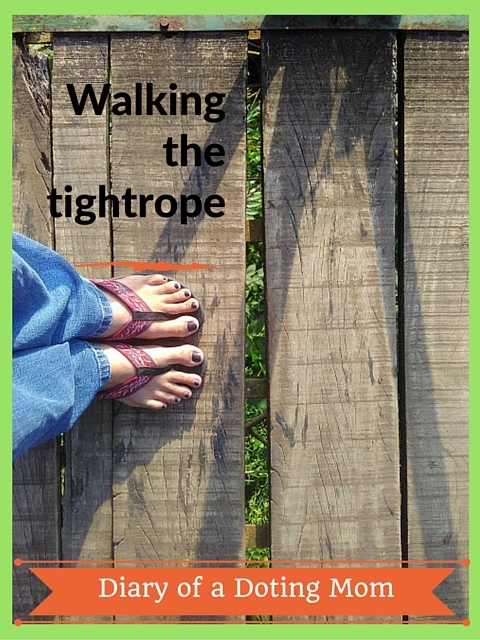 So, yes, it’s a tightrope that we’re both walking and it’s scary at first. On the one hand, we need to let them make their mistakes, pick themselves up and be as hands off as possible without being permissive. On the other hand , we have to be compassionate with focus. We cannot condone rude behaviour, defiance or absolute flouting of rules. We’ve got to make them see that it comes with consequences. Most often, it’s not so cut and dried. There are going to be squabbles, disagreements with the way you parent and even some ‘You’re a mean mom’ statements thrown at you. Don’t take it personally. Let the anger cool and sit them down to discuss things calmly when you both are receptive. As long as we remember that this is a mutual partnership- this bond between parent and child- walking that tightrope becomes just a wee bit easier and far more enjoyable. Oh and the really beautiful part? Let go and hold on with love. It makes everything better. I am not quite there yet (parenting a tween), but honestly, this parenting thing is HARD. At any age, and at every age. It is rewarding, yes, but hard. The challenges vary, but it is always a tight rope that we walk between being a good parent and a cool parent (much like the kids, I say)! Tell me about it. It's been getting progressively harder with each year and easier too. I know it feels like a mountain of overwhelm on some days. Also I doubt I will ever completely be the cool parent, in any case. Apart from sibling squabbles, pretty much everything else is the same here. When they are not compliant, uff, I know what you mean. Let's just cross our fingers and hope for the best. Parenting a true Tween (about to turn teen) here and a 9, nearly 10 Tween too, and it is such a balance, trying to create the best for them!! !